Place of the Second Battle of Newbury: North of the town of Newbury in the County of Berkshire. The forces of King Charles I against the forces of Parliament. 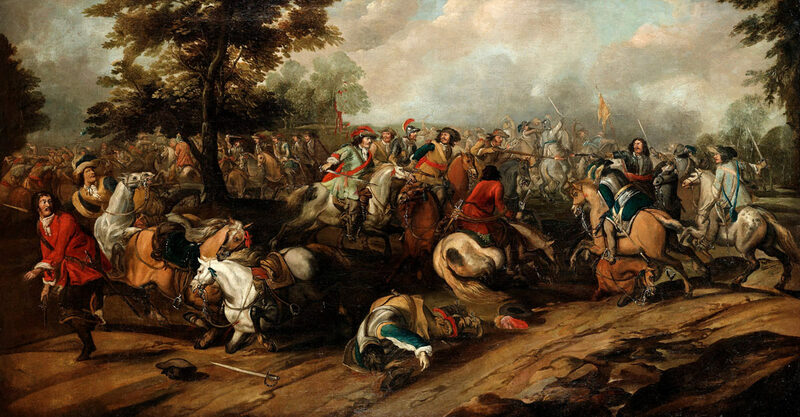 Generals at the Second Battle of Newbury: King Charles I commanded his army at the Second Battle of Newbury. The Parliamentary force comprised the united armies of the Earl of Essex, commanded in his absence due to illness by Sir William Balfour (the Horse) and Major-General Philip Skippon (the Foot), the Earl of Manchester and Sir William Waller. The Royalist army numbered around 9,000 men and was particularly weak in cavalry after the dispatch of the Earl of Northampton with 500 Horse to relieve Banbury Castle. The Parliamentary army number around 19,000 men of which some 6,000 were Horse and Dragoons. Winner of the Second Battle of Newbury: The battle is considered a draw. The Parliamentary army claimed a victory but failed to prevent the King’s army from marching away during the night after the battle. The decisive victory sought by Parliament did not materialise. The Royalists lifted the siege of Donnington Castle but not of Basing House. Following the King’s highly successful campaign at Lostwithiel in Cornwall in the summer of 1644 and the escape of the Earl of Essex to London leaving his Parliamentary army to an abject surrender, less the majority of his cavalry that broke out under Sir William Balfour to Plymouth, the Parliament in London feared a swift descent on London by the Royalist army. This did not materialise. King Charles I spent some time in the West Country restoring his army’s supplies and equipment and reducing the Parliamentary garrisons in the area. On 31st September 1644 the King met with Prince Rupert near Chard in Somerset. 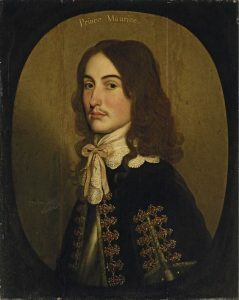 Prince Rupert was dispatched to Bristol to assemble the Royalist Foot currently in Wales and to march with them and the 2,000 Horse brought down from the North into Gloucestershire. In the autumn of 1644 the King moved to relieve the Royalist garrisons under siege in Banbury Castle, Donnington Castle near Newbury and Basing House in Hampshire. His intention was then to put his army into winter quarters. 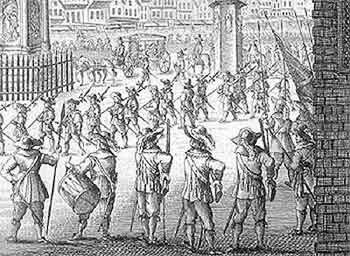 A march on London in late 1644 was not part of the King’s plans. On 15th October 1644 the King advanced to Salisbury. This threat brought the Parliamentary commanders to co-operate in bringing their forces together. The Earl of Manchester brought his army south from Yorkshire after the Battle of Marston Moor and now on 18th October 1644 marched into Basingstoke, while calling up three regiments of London Trained Bands stationed at Reading. On the same day Lord Goring drove Sir William Waller’s Parliamentary force out of Andover causing Waller to fall back on Basingstoke where he joined the Earl of Manchester. 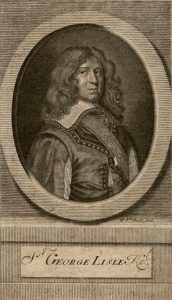 The Foot from the Earl of Essex’s army beaten at Lostwithiel arrived under Major General Philip Skippon at Alton to the south of Basingstoke on 20th October 1644 and Sir William Balfour brought Essex’s Horse to the assembling Parliamentary army. The combined Parliamentary army comprising around 6,000 Foot and 3,000 Horse of Manchester’s force, 3,000 Foot and 1,000 Horse of Sir William Waller’s Force, 3,000 of Major-General Skippon’s Foot and 3,000 of Sir William Balfour’s Horse now blocked the Royalist advance to relieve Basing House, which lay immediately to the east of Basingstoke. Waller reported to Parliament that the various Parliamentary forces in the area were now combined and a battle could be expected. The King now marched through Berkshire reaching Newbury on 22nd October 1644. The Parliamentary force around Donnington Castle abandoned the siege in the face of the Royalist advance. King Charles I received the commander of the Donnington garrison Lieutenant-Colonel John Boys, promoted him colonel and knighted him. The Earl of Northampton was sent to relieve Banbury Castle with a force of 800 Horse augmented by a party of Foot from the Oxford garrison. 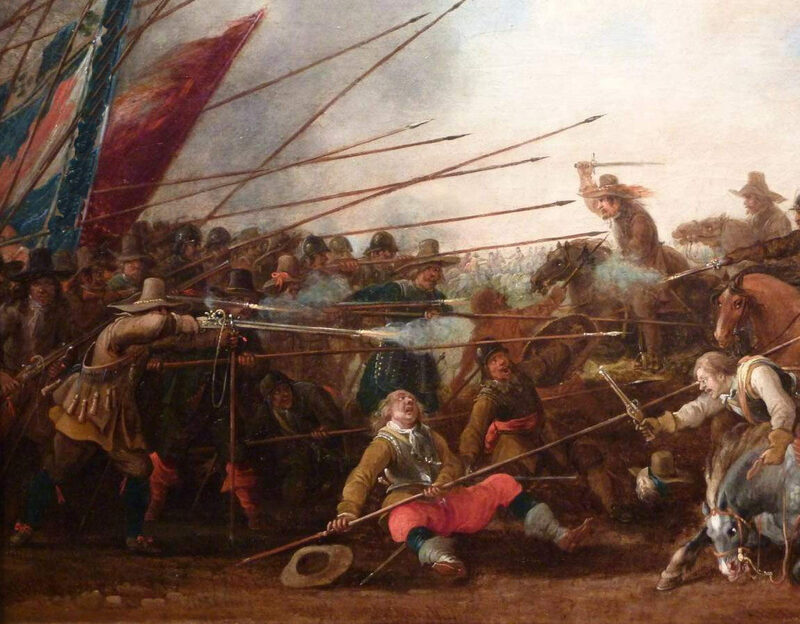 This detachment drastically reduced the cavalry when the Royalist army was already heavily out-numbered. The Royalist army lay in quarters around Newbury while the Parliamentary troops approached to attack. On 25th October 1644 the Parliamentary army reached Thatcham some four miles from Newbury. The main drawback for the Parliamentary army was its lack of a clear chain of command. Parliament had appointed a committee in London to direct the army and another committee of officers and civilians in the field to implement the orders from London and take more immediate decisions. The senior Parliamentary commanders did not get on with each other, relations between the Earl of Essex and Sir William Waller being notoriously bad. In the event the Earl of Essex was taken ill and left in Reading probably easing the decision making process. The King refused to withdraw or otherwise avoid battle with the approaching Parliamentary army, in spite of being heavily outnumbered and being particularly weak in cavalry. The Royalist army formed up to the north of Newbury with its right flank resting on the Kennet River in a series of positions along the diminutive River Lambourn to the west, with the fortified Shaw House in the centre and Donnington Castle with its battle-hardened garrison on the left. Command of the Parliamentary army was fragmented. Manchester was the senior officer on the Council but lacked ability and drive. Cromwell was still relatively junior, commanding only his Eastern Association Horse. Essex was ill in Reading so the generals of his Foot, Major-General Skippon, and Horse, Sir William Balfour, lacked an overall direction. 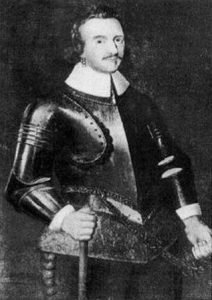 Sir William Waller commanded his own troops. The London Trained Bands were an independent force. On 26th October 1644 the Parliamentary army made contact with the Royalist army and probed along its positions, desultory fighting taking place along the line with a heavy artillery bombardment of the Royalists in Shaw House from Clay Hill. The Parliamentary army council then met to decide on its plan of attack. The plan adopted by the Parliamentary Council, probably on Sir William Waller’s suggestion, was to march in a wide detour to the north around the Royalist positions and attack on the extreme left flank through Speen Village while a simultaneous attack was made on the eastern end of the Royalist line at Shaw. The distance to be marched was some 13 miles with the route lying through the villages of Hermitage, Chieveley, Winterbourne, Boxford, across the River Lambourn with a turn to the east across Wickham Heath to Speen. A cannon shot would signal the attack from the Parliamentary outflanking force and the Earl of Manchester would begin a simultaneous attack on the Royalist right. Gaining information of the Parliamentary intentions the King moved Prince Maurice’s Cornish Foot and Horse to Speen, where they built a redoubt armed with several guns. The three brigades of Foot of Sir Bernard Astley, Colonel George Lisle and Colonel Thomas Blagge under the direction of Lord Astley commander of the Royalist Foot occupied the ground around Shaw Village. 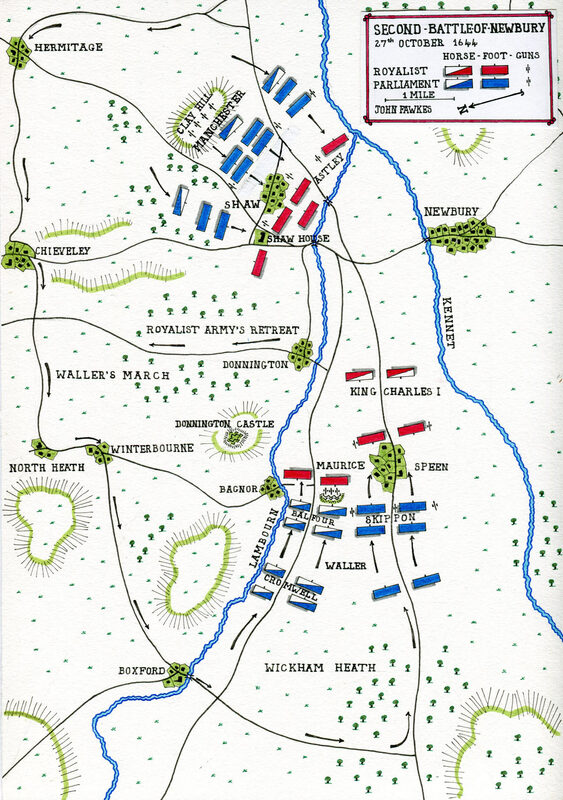 Sir Humphrey Bennet’s brigade of Horse held the centre with detachments to the south of Newbury and at the crossings of the Lambourn at Bagnor and on the route of the Parliamentary outflanking detour at Boxford. The Parliamentary outflanking force comprised the Horse and Foot of the Earl of Essex’s army, and Waller’s and Cromwell’s Horse with Waller and Skippon in command. Roughly one third or some 5,000 men were left to mount the attack commanded by the Earl of Manchester on the Royalist positions around Shaw Village. 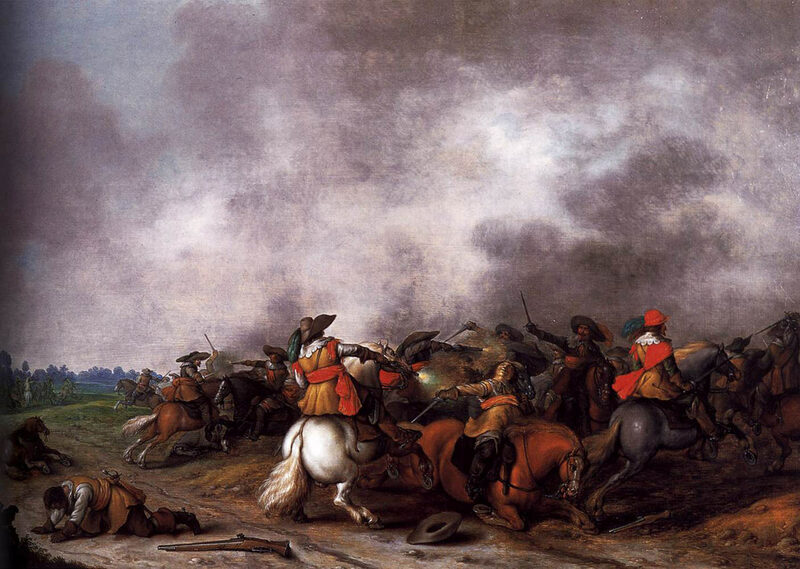 Waller’s outflanking force began its march in the early hours of 27th October 1644. It was observed by Colonel Boys in Donnington Castle before it crossed the Lambourn, driving off the detachment of Royalist Horse at Boxford. It crossed Wickham Heath and approached Speen during the afternoon. 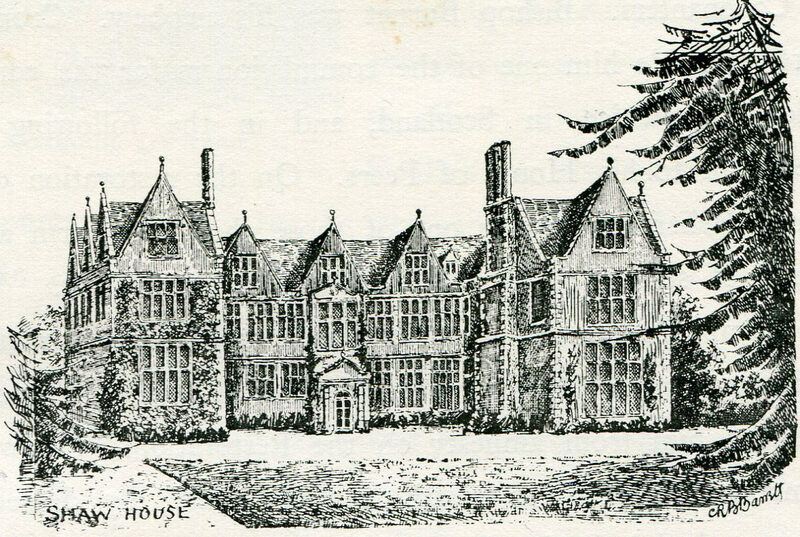 Instead of waiting for the signal from Waller the Earl of Manchester began his attack on the Royalist right positioned at Shaw House and in Shaw village early in the day. After some initial success Manchester’s Parliamentary force was driven back in some confusion. At around 3pm Waller was in position to the west of Speen on the Royalist left flank and began his attack. Waller’s force came under heavy fire from the Royalist artillery in Prince Maurice’s redoubt and from the four demi-culverin cannon in Donnington Castle. 800 musketeers from Essex’s army supported by Aldridge’s brigade of Horse attacked the redoubt while the rest of the Parliamentary force stormed into Speen Village, held by Prince Maurice’s Cornishmen. It took around an hour of the limited daylight left for the Parliamentary attack to take the redoubt and Speen village forcing Prince Maurice’s men into a confused retreat. Sir William Balfour pursued the retreating Cornish troops and encountered a reserve outside Speen commanded by the King himself. The King was rescued by the intervention of his Life Guard commanded by Lord Bernard Stuart and two troops of the Queen’s Regiment led by Sir John Campsfield. Cromwell was coming up with a reserve of cavalry but seems to have failed to take advantage of the Royalist collapse by attacking promptly. Lord Goring charged Cromwell’s men with Lord Cleveland’s brigade of Horse driving Cromwell back. Balfour’s Horse came under fire from Colonel Thomas Blagge’s musketeers positioned along the hedges and ditches on the outskirts of Speen and was then counter-attacked and driven back by Sir Humphrey Bennet’s rallied brigade of Horse. The fighting continued until night fell but the Parliamentary attack on the Royalist left flank had been held. On the Royalist right the Earl of Manchester finally began his second attack at around 4.30pm with little daylight left. Manchester launched two columns from Clay Hill, the right hand column attacking Shaw House and the larger left hand column advancing into Shaw Village. Both attacks were held and driven back. Before the Parliamentary assault could be resumed darkness had fallen. During the night King Charles I, deciding that it was unrealistic to expect his much smaller army to resist the Parliamentary attack on the next day marched out through the gap between Shaw House and Donnington Castle. The Royalist wounded, guns and baggage were left at Donnington Castle with Colonel Boys. The Parliamentary forces seem to have been unaware of the Royalist retreat and took no steps to intervene and prevent the move. No figures for casualties are available. Clarendon’s detailed account of the battle suggests high casualties on both sides from the fighting around Speen in the west and Shaw in the east. There were perhaps around 1,000 casualties on each side. 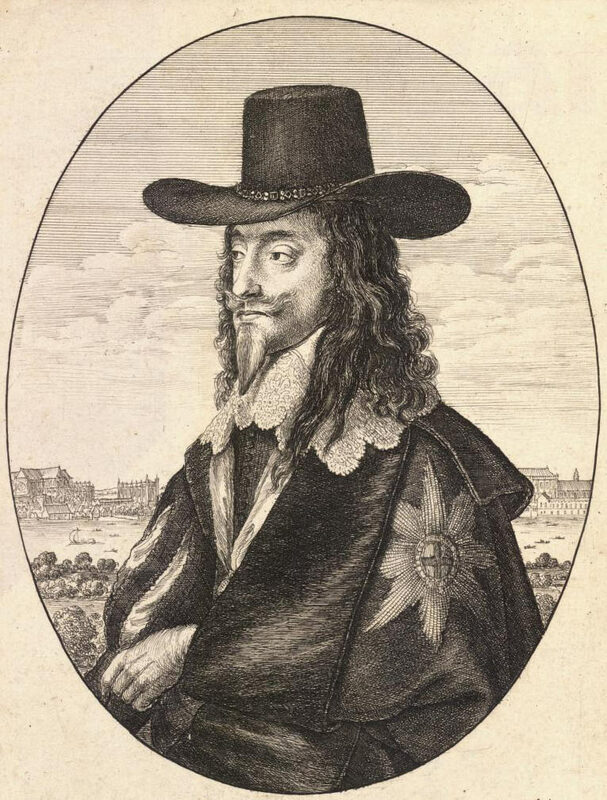 After the Royal army’s retreat from Newbury King Charles I set off to Bath to meet Prince Rupert and his force. Prince Maurice led the army to Wallingford and then on to Oxford. 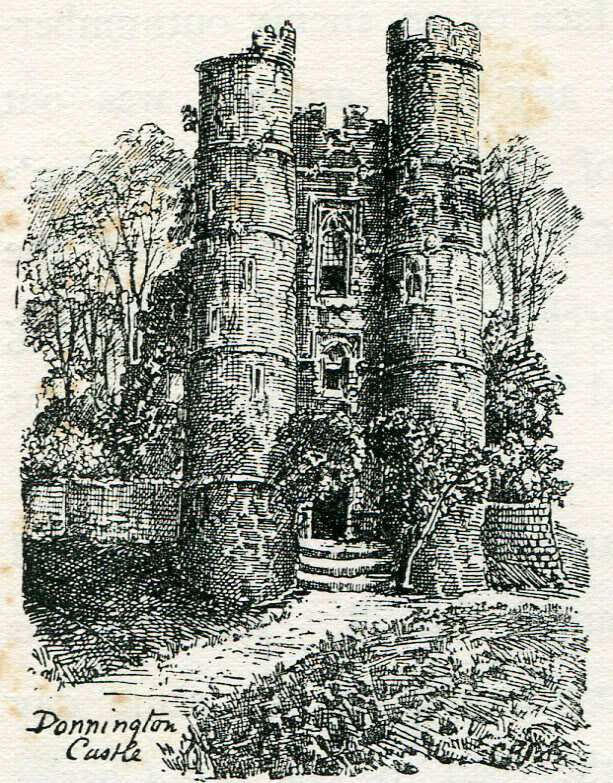 The Parliamentary army occupied Newbury and turned its attention to Donnington Castle. 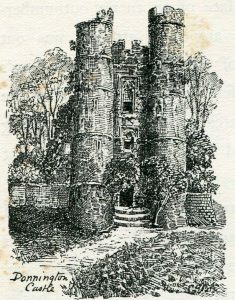 Every request for the castle to be surrendered was rebuffed by Colonel Boys. An attack on the castle was prepared but the officer commanding the assault was killed and the Parliamentary force withdrew to Newbury. The King accompanied by Prince Rupert and his force from Bath met the Earl of Northampton with the troops that had relieved Banbury Castle. 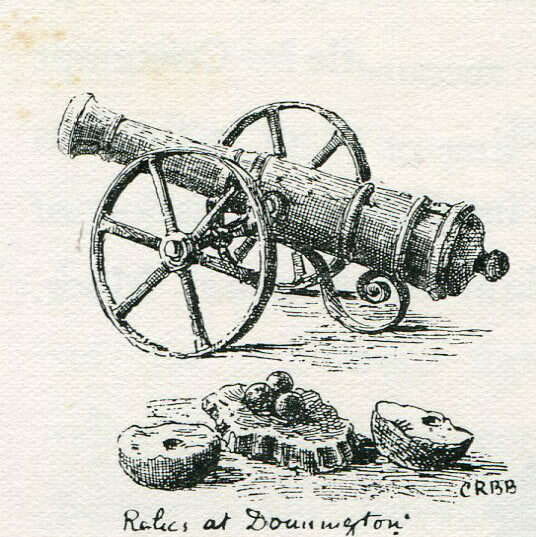 This force returned to Newbury and re-supplied Donnington Castle before withdrawing again towards Oxford with the guns and baggage left after the battle. The Parliamentary army did nothing to interfere with this operation other than taking up positions for battle should the King choose to attack. The two armies now ceased active operations for the period of the winter. The guns captured from Prince Maurice’s Cornishmen in the redoubt outside Speen were guns surrendered by Essex’s army in the capitulation at Lostwithiel the previous month. 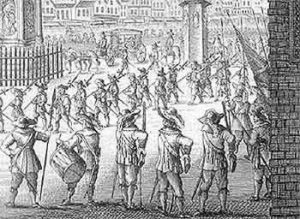 It is apparent from Clarendon’s description of the Second Battle of Newbury that it was the practice of musketeers to use their muskets as clubs. Clarendon describes the Earl of Manchester’s men as singing psalms as they advanced to attack Shaw village.